Ø Made with Arabica coffee. 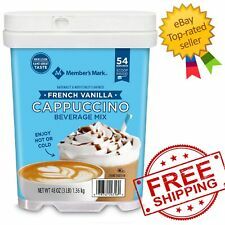 Ø 54 servings per container. 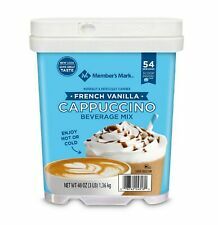 Member's Mark Cappuccino Variety Pack (0.53 oz. cups, 54 ct.)*BEST PRICE**. Condition is New. Shipped with USPS Priority Mail. Fa ir trade ce rt if ie d.
Made with Arabica coffee. About this item. Trending at $16.21eBay determines this price through a machine learned model of the product's sale prices within the last 90 days. Carefully selected red coffee cherries, along with a special roasting process, bring different and unique characteristics such as rich body and smoky notes to our darkest coffee. This 100-count box is ideal for waiting areas, employee breakrooms and households that love hot coffee. Member's Mark Colombian Supremo Coffee, Single-Serve Cups 100 ct. Surrounded by an intense, distinct aroma, it has notes of chocolate and hazelnut. This 100-count box is ideal for waiting areas, employee break rooms and households that love hot coffee. This blend uses two types of coffee: naturally processed and washed process. Carefully selected red coffee cherries, along with a special roasting process, bring different and unique characteristics such as rich body and smoky notes to our darkest coffee. This 100-count box is ideal. Typical of dark roasts, our Organic Dark Roast stimulates the senses with its dark chocolate brown color, bold aroma and rich taste. Dark chocolate and roasted notes. USDA Organic. 100% Colombian Arabica coffee. This 100-count box is ideal for waiting areas, employee breakrooms and households that love fresh, hot coffee. This blend uses two types of coffee: naturally processed and washed process. The washed process gives the blend a crisp, clean cup and purity of flavor. Three flavors of delicious cappucccino. About this item. This 80-count box is ideal for waiting areas, employee break rooms an. Colombian grown. d households that love hot coffee. Typical of dark roasts, our Organic Dark Roast stimulates the senses with its dark chocolate brown color, bold aroma and rich taste. With a lon. Net weight: 35.03 oz (1.05 kg). Combines coffee, milk, and vanilla flavors. Gluten free. Serve hot, iced, or blended. 100% Colombian Arabica Coffee. Size : 0.40 OZ (11.5 g) Each K-Cup Pod. 100% Colombian Arabica coffee. Surrounded by an intense, distinct aroma, it has notes of chocolate and hazelnut. Sweet chocolate and hazelnut notes. Member's Mark Sliced Almonds 2 lbs. Almonds are a good source of fiber and antioxidant Vitamin E. Grown and manufactured in the USA by families, for families. High fiber. 100% Colombian Arabica coffee. Sweet chocolate and hazelnut notes. Bold, rich and smoky, our French roast is the tall, dark stranger in your coffee rotation. We use 100% Arabica beans and keep it Fair Trade Certified. Roasted aroma with a high body. 100% Colombian Arabica beans. Carefully selected red coffee cherries, along with a special roasting process, bring different and unique characteristics such as rich body and smoky notes to our darkest coffee. · Roasted aroma with a high body. It's ready in an instant! Made with Arabica coffee. Enjoy hot or cold. We stand behind all our products. CON GUSTO LO ATIENDO EN ESPANOL. Get an organic jolt in the AM with our breakfast blend. We use Fair Trade Certified Arabica beans, light roasted for a sunny taste—and more caffeine. USDA Organic. 100% Colombian Arabica coffee. Why we love this. · Three flavors of delicious cappucccino. Trending at $27.48eBay determines this price through a machine learned model of the product's sale prices within the last 90 days. 100% Colombian Arabica Coffee. Size : 0.41 OZ (11.6 g) Each K-Cup Pod. Fair Trade Certified. Almonds are a always a great staple ingredient for baking and your favorite recipes. Our sliced almonds are a good alternative to other snacks. Grown and manufactured in the USA by families, for families. Three flavors of delicious cappucccino. Order cannot be cancelled after 30 minutes once it is placed. Made with Arabica coffee. About this item. Kosher dairy. Three flavors of delicious cappucccino. Made with Arabica coffee. Component Country. United States. Assembled Country. Policies & plans. Trending at $15.07eBay determines this price through a machine learned model of the product's sale prices within the last 90 days. This 80-count box is ideal for waiting areas, employee break rooms and households that love hot coffee. 100% Colombian Arabica coffee. Colombian grown. Net weight: 32.45 oz ( 920 g). About this item.